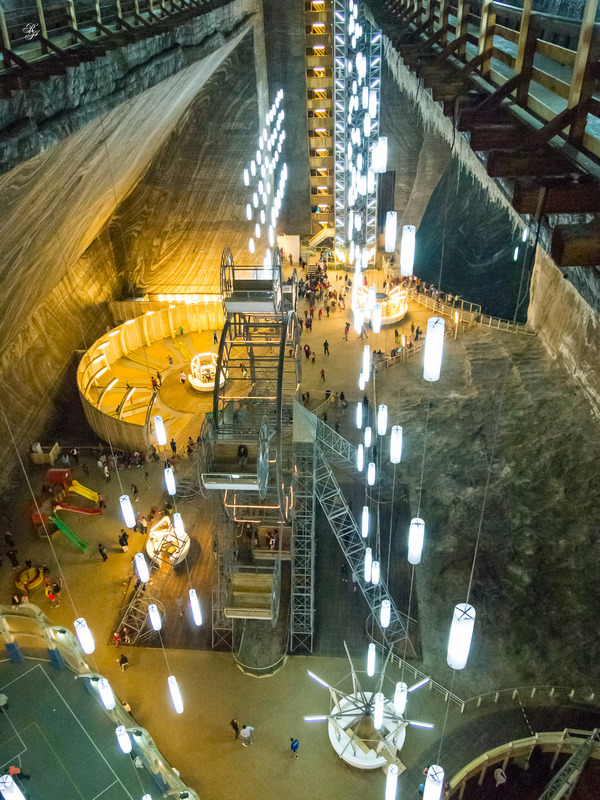 The Turda Salt Mine (Salina Turda) has been in use since antiquity. 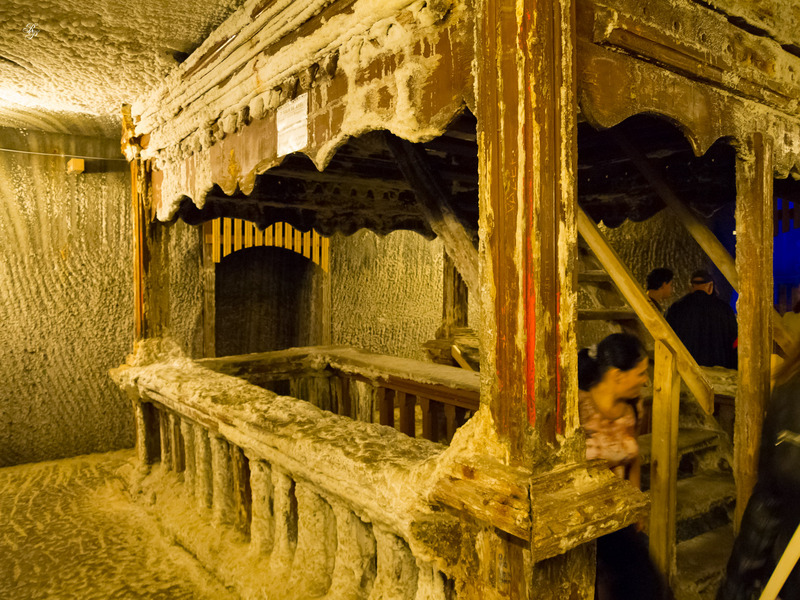 The Romans most likely got their salt from there after they conquered Dacia. 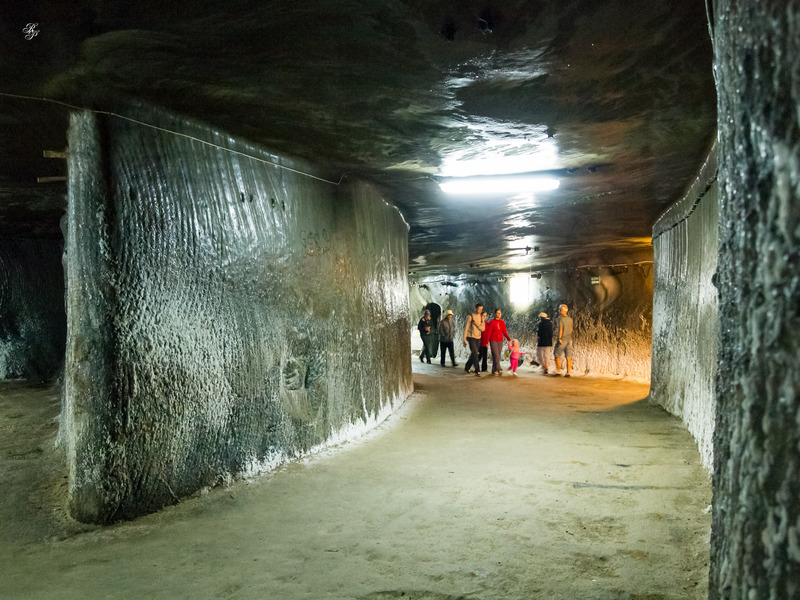 Although the deposits are plentiful, salt mining was stopped there in 1932. 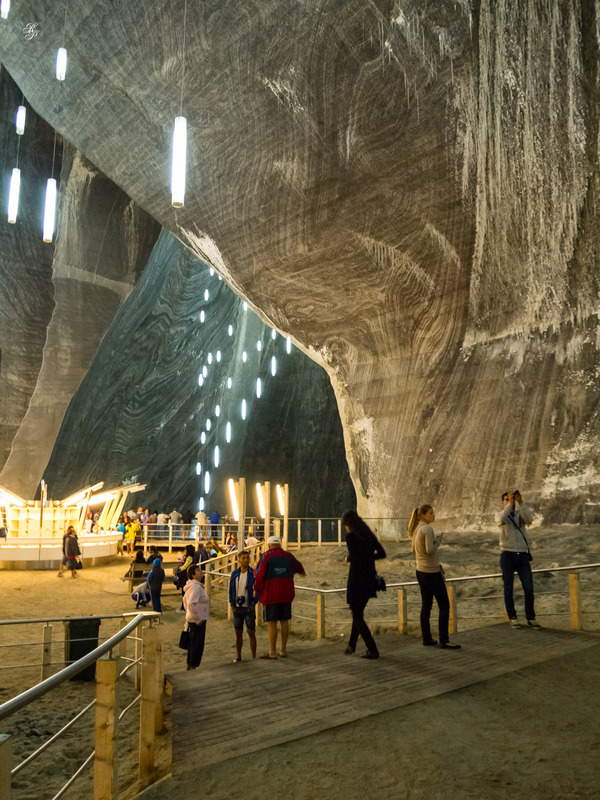 When I say they’re plentiful, I mean the salt deposits run underground from Turda to Dej and go as deep as 2,600 meters. 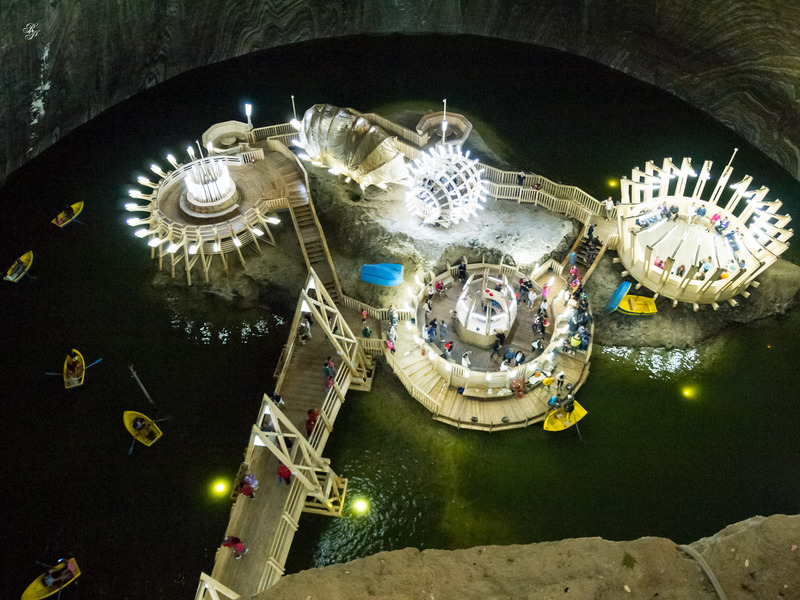 They’re barely scratching the surface in the Turda and Dej Salt Mines. 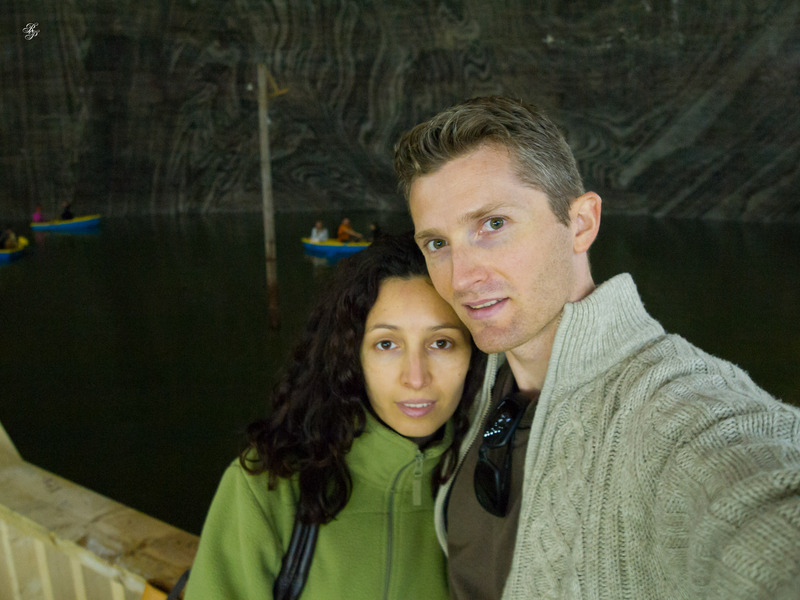 When I talk to our friends from abroad about Romania, I talk about how rich it is in natural wealth. Salt is just part of that incredible wealth. 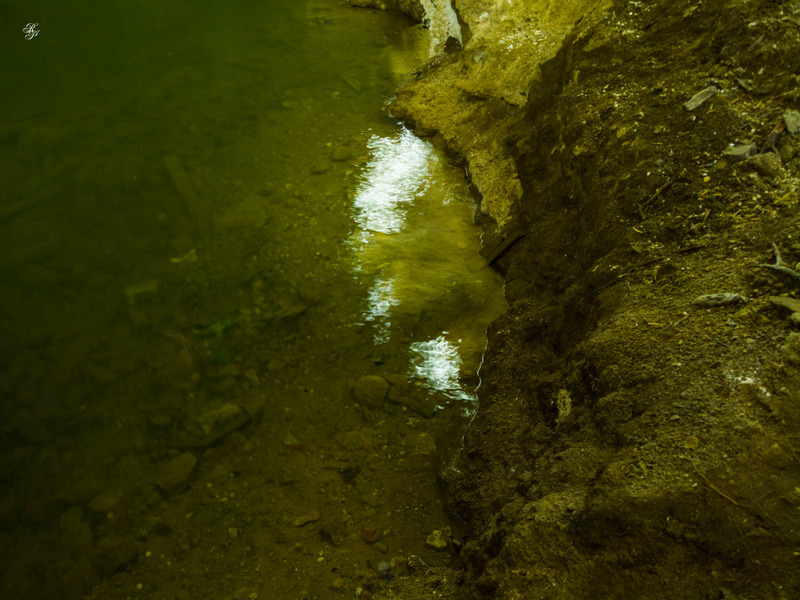 The Romans and then the Austro-Hungarian empire were so keen to get their hands on Transilvania because of its gold and silver deposits as well and nowadays, a foreign gold concern is trying to scrape whatever gold is left, through whatever means necessary, including environmental disaster, from Rosia Montana. But let’s get back to the salt. 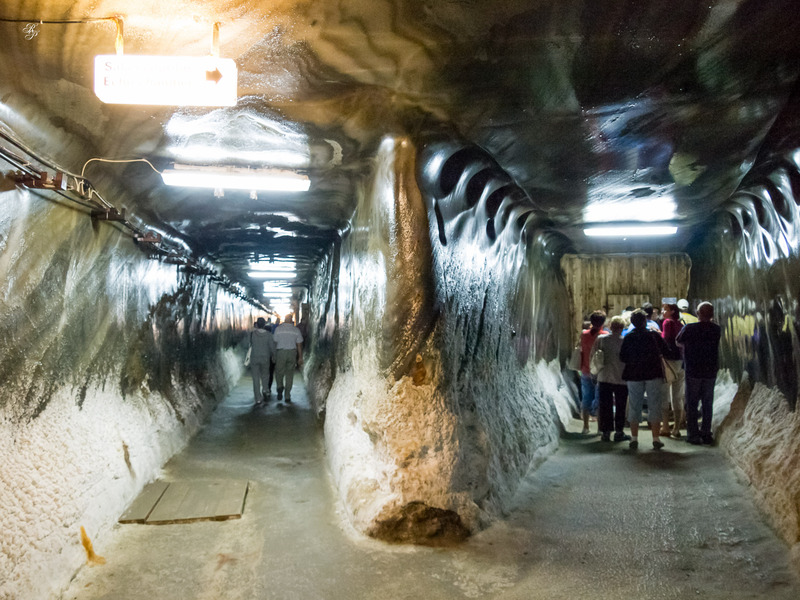 You enter the mine through a tunnel that stretches about 300 meters. 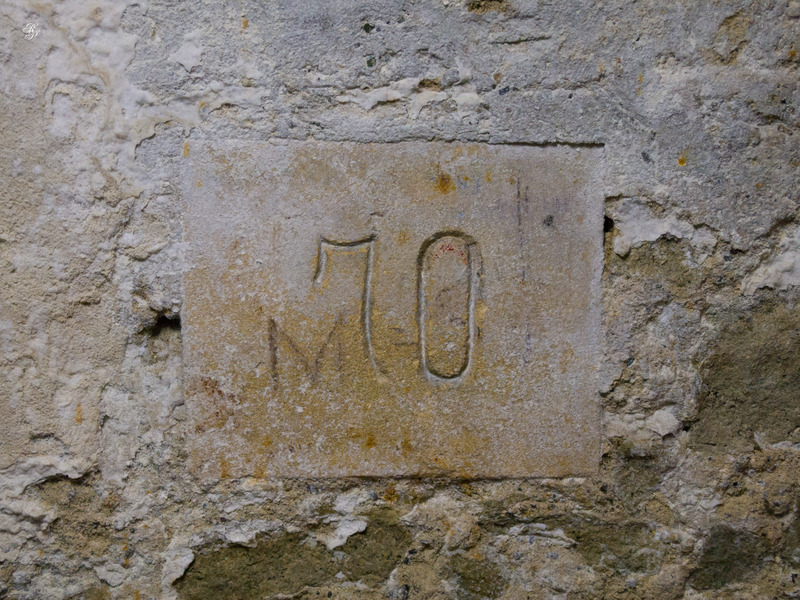 On the walls, the meters are marked with inscriptions. 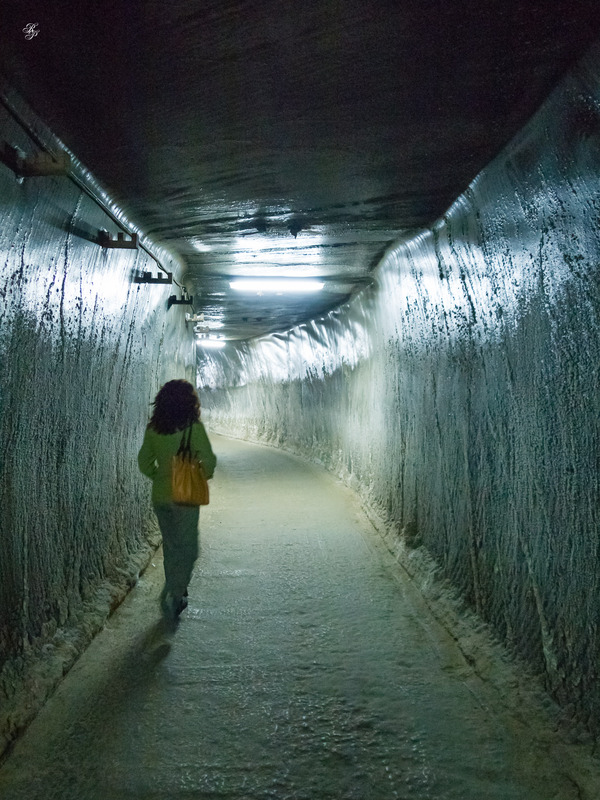 After walking through the tunnel for what seems like a looooong time, you finally reach the inside of the salt mine, where everything is solid salt (the floor, the walls and the ceiling). 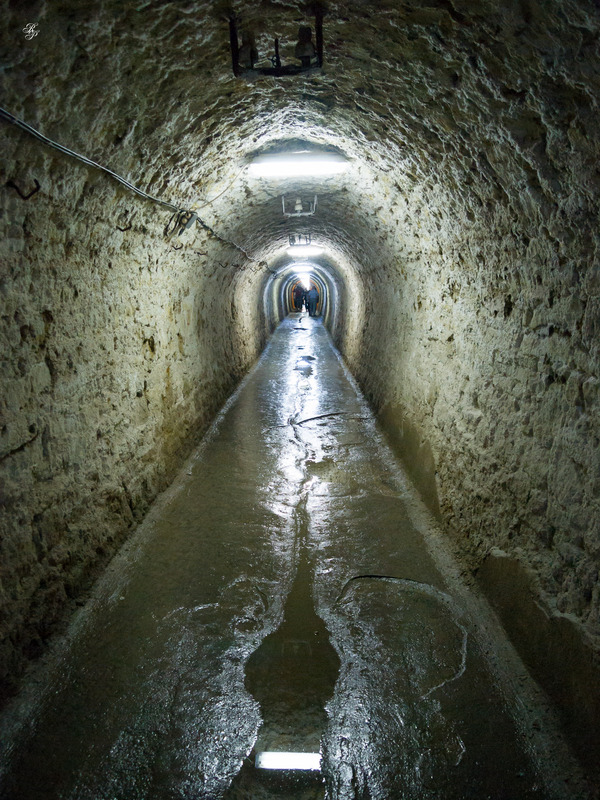 The main tunnel soon breaks off into different directions. 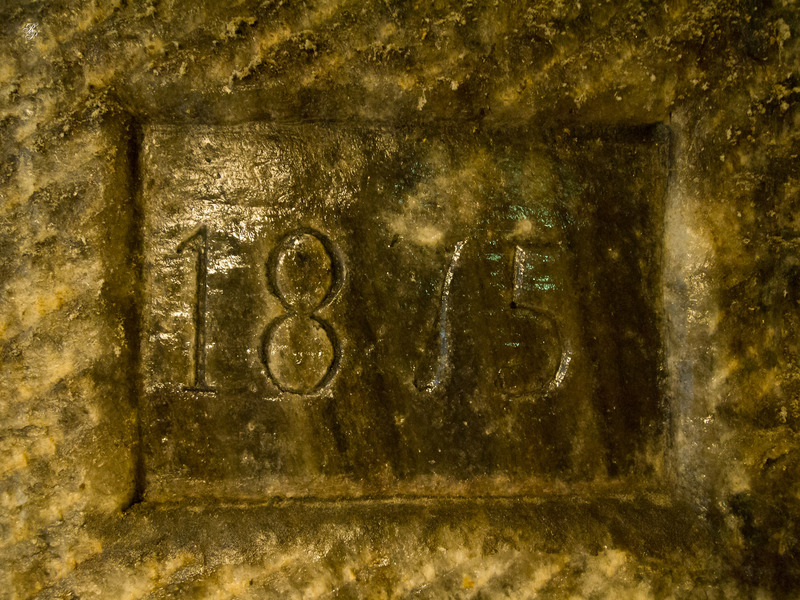 In one of the halls, the machine used to mine the salt, called a salt scraper, is on display. Initially, it was powered by men, then by horses. It would scrape horizontally and vertically. 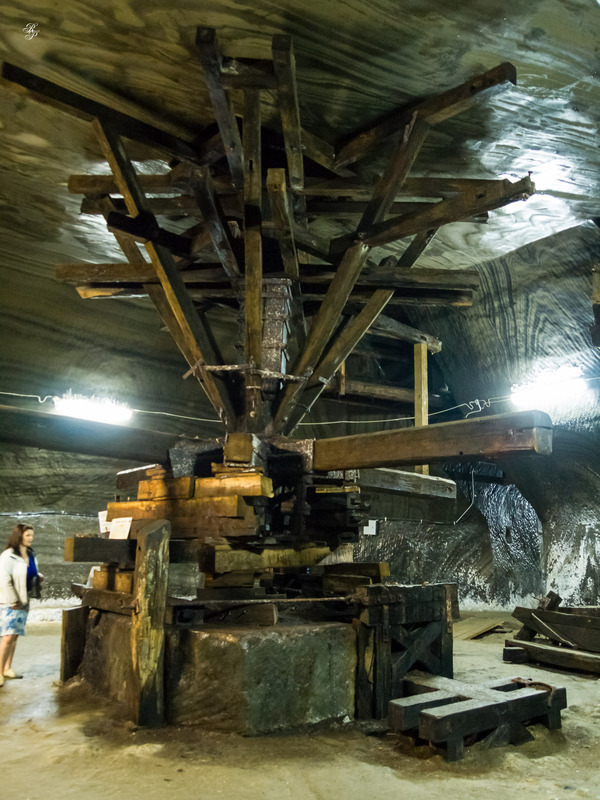 Salt would then be loaded onto iron carts and pushed outside. 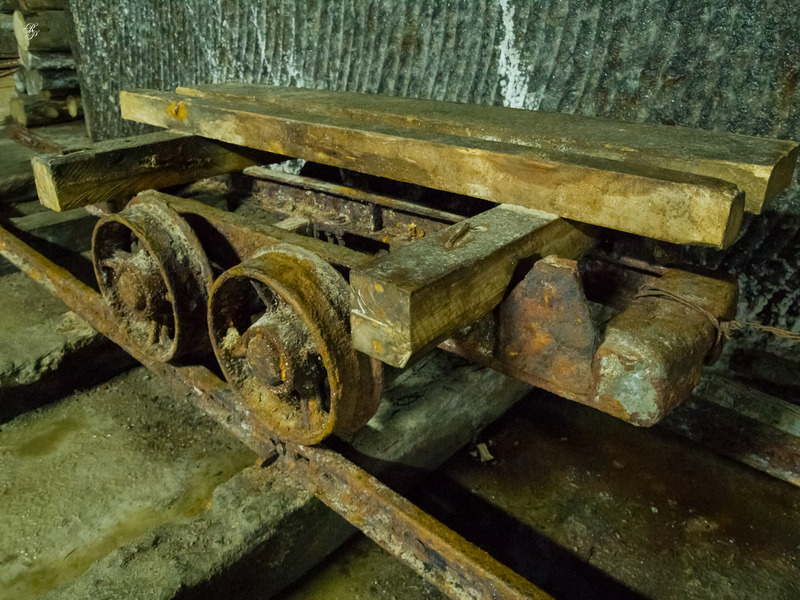 One thing you notice right away is how corroded all the metal is. 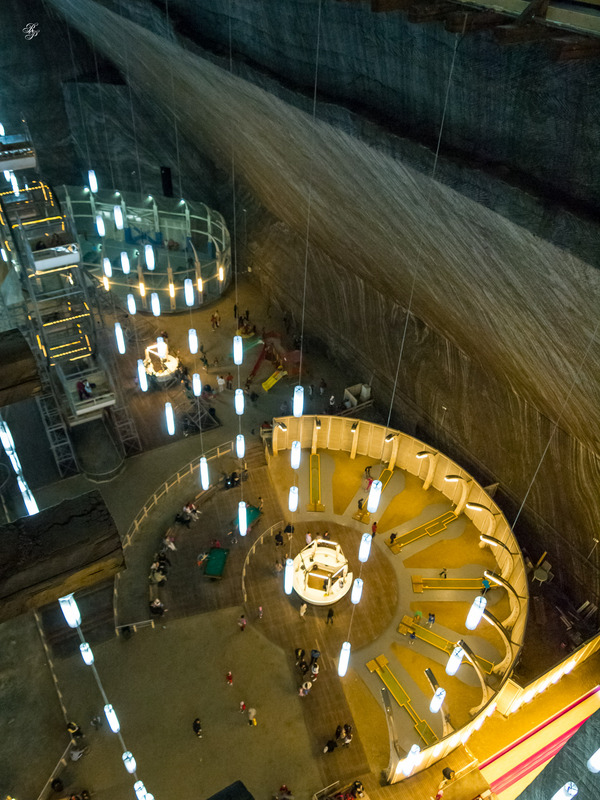 Inside a salt mine, it’s to be expected. 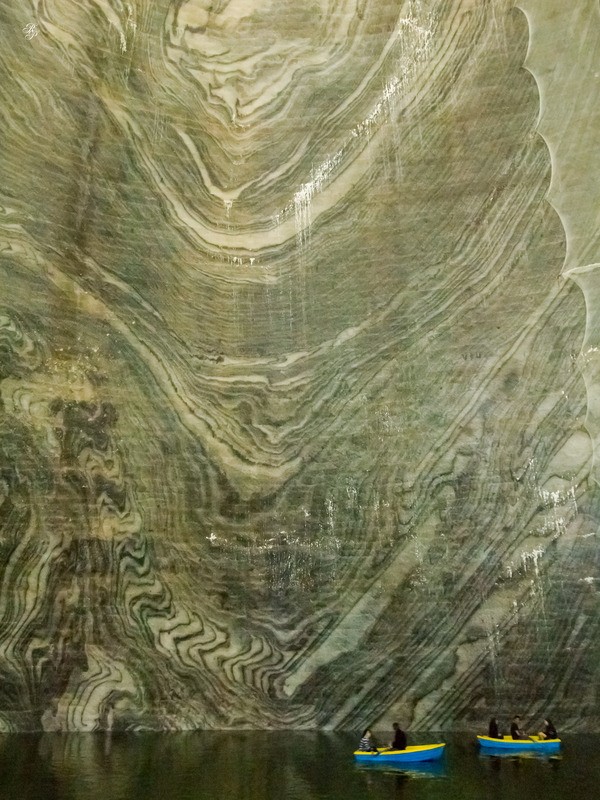 For some reason, fir wood holds up in that terribly salty environment very well, so it’s used everywhere for structural support and functional purposes. 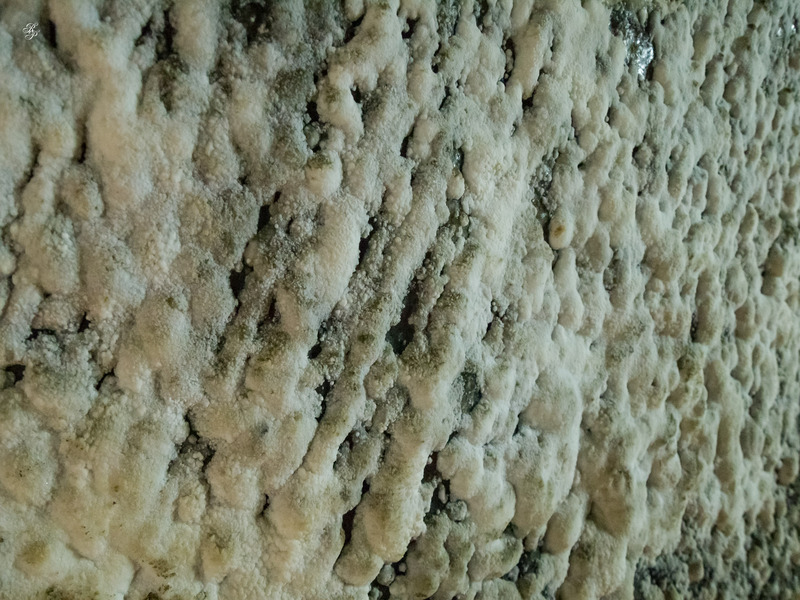 The texture of the walls ranges from pure, translucent crystal to what we know as salt, little white crystals that can be scraped off with our fingernails. 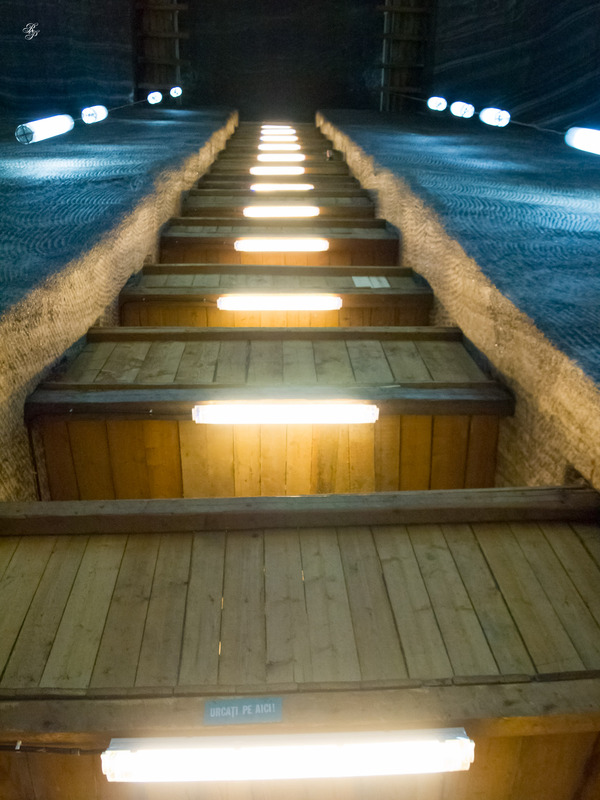 After you ascend on the staircase shown above, you enter a lower hall where one of the walls does not exist. 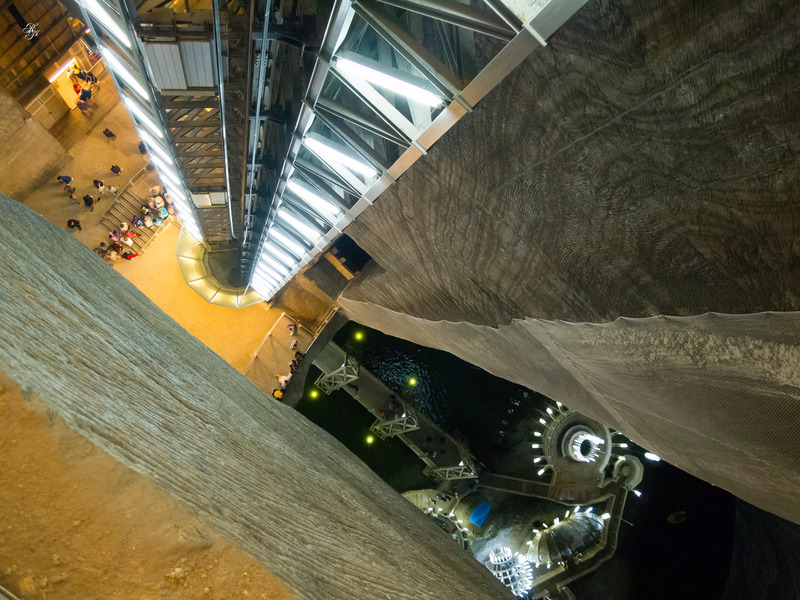 You walk to the edge and lo and behold, you find yourself centimeters away from a vertigo-inducing precipice. 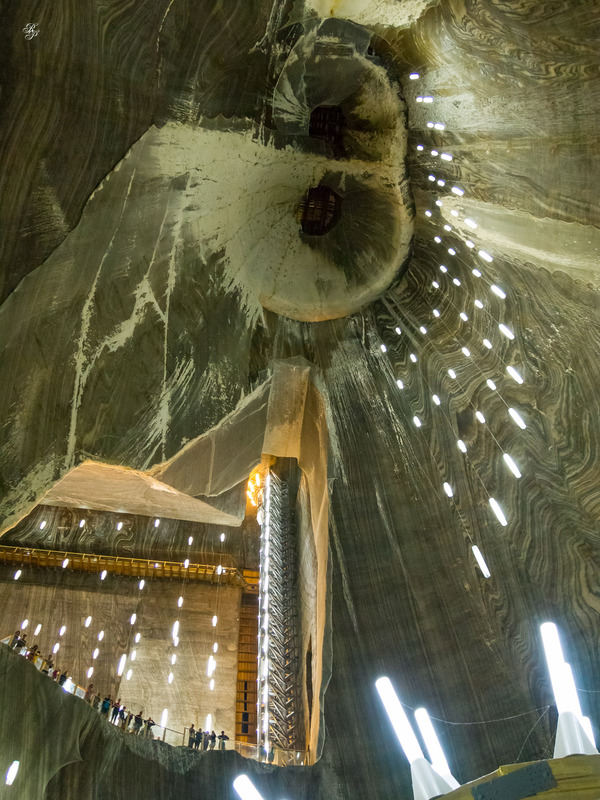 It’s a vertical drop at least 150 meters down and before you have a chance to recover from that shock, you see this otherworldly appearance. 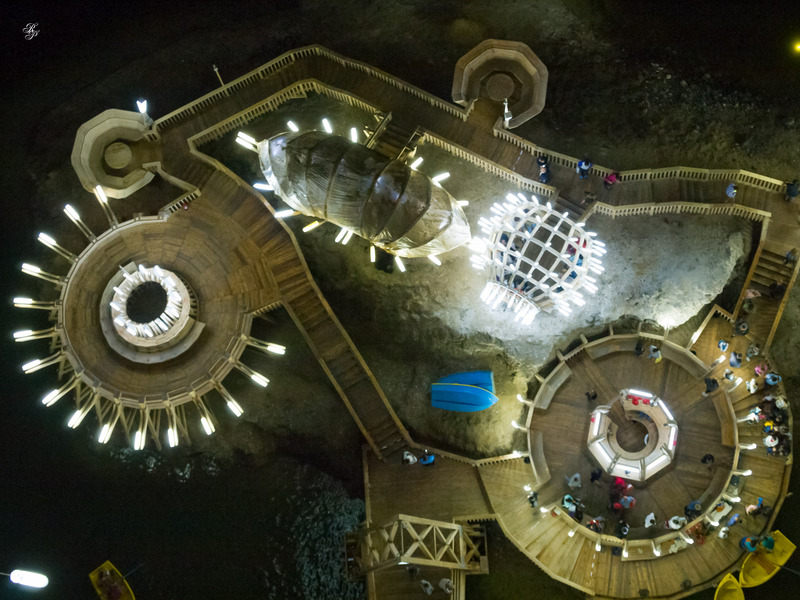 At first it seems like a spaceship parked there. 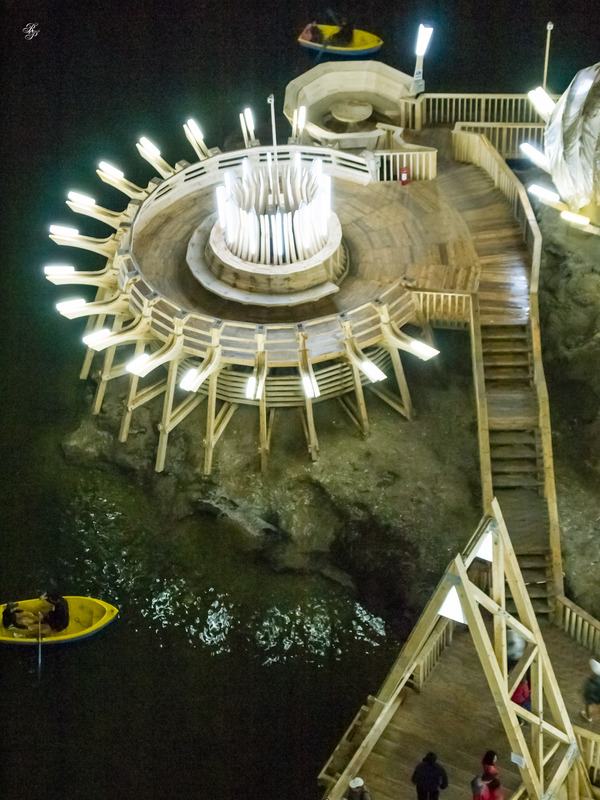 Then you realize it’s an underground lake with a manmade island and wooden structures, artistically lit. So you look around to see how you can get down there and you see this. 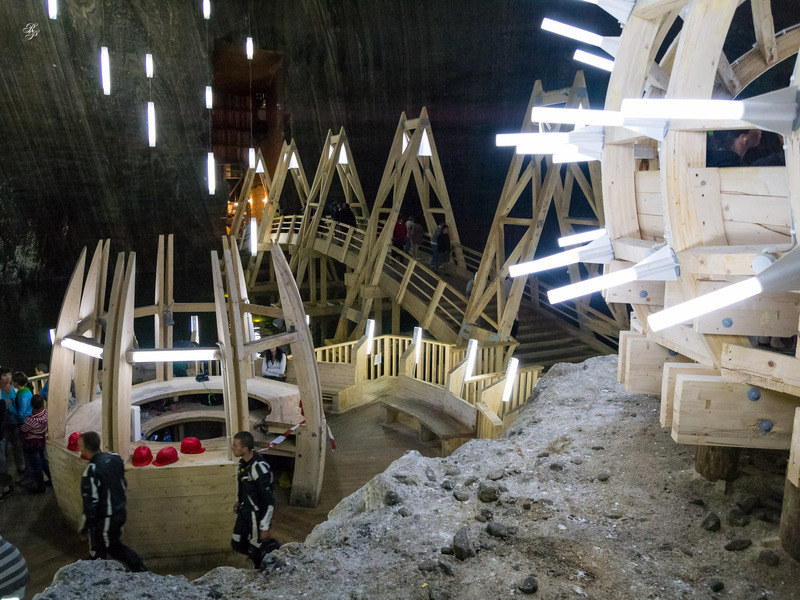 The solid salt walls are carved straight down, as a ravine, and they open up into a huge underground hall filled with all sorts of playgrounds. There are elevators to ferry you up and down but the lines are long, so we took the stairs. 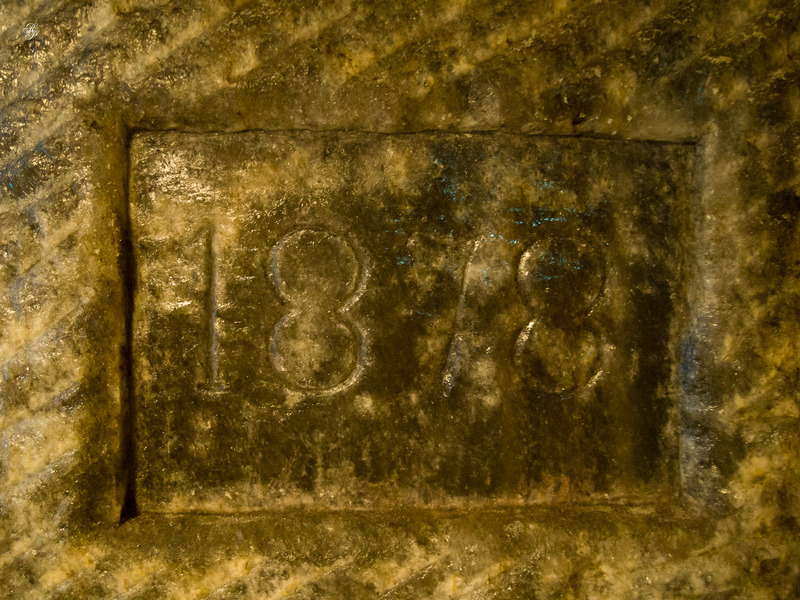 On the walls, the years in which those levels were reached are marked with inscriptions. 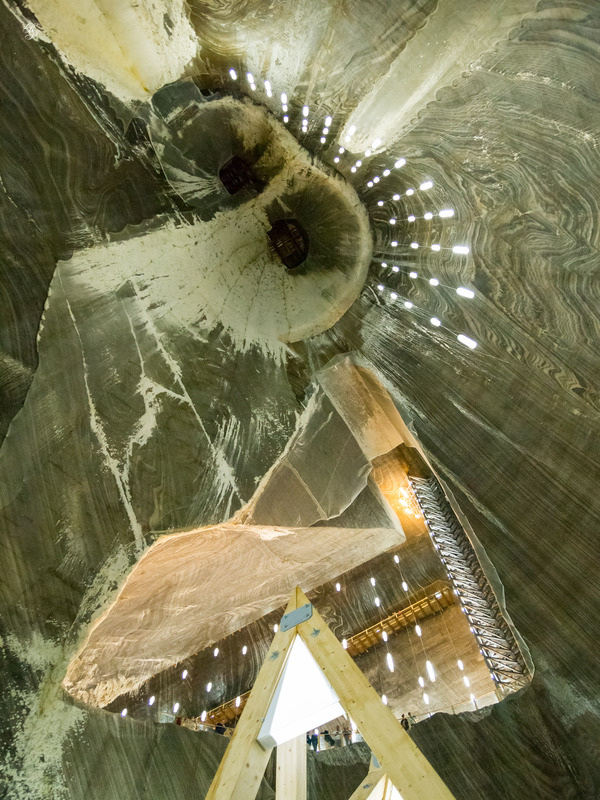 The view up from the bottom of the staircase. Inside, this is how things look. Just when you think you can walk over to that ET island, you realize you have to descend several more levels. 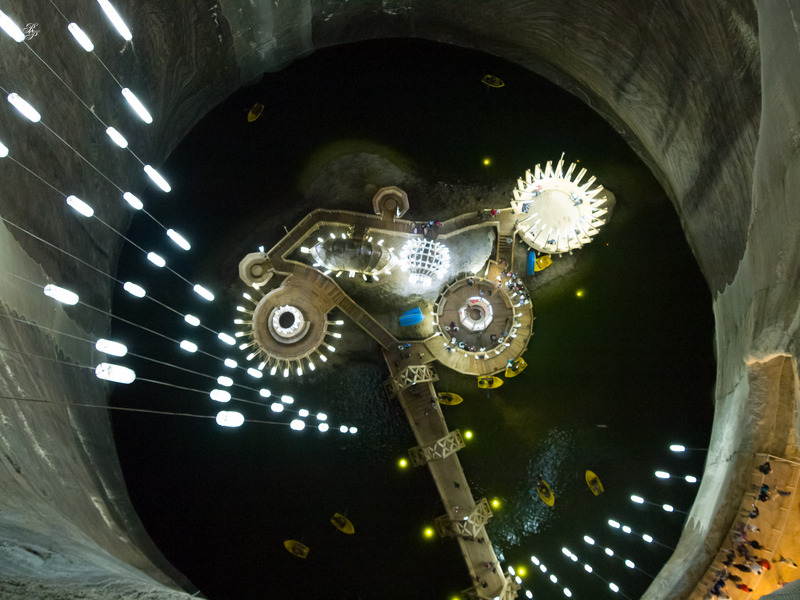 This is how things look like from down there. Great artistry can be seen in the woodwork here. 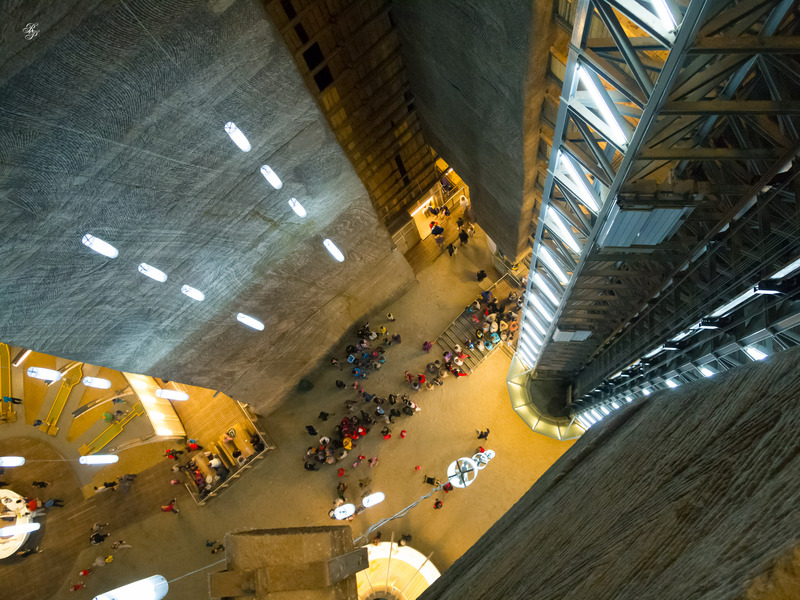 Just so you get a sense of the scale of that place. 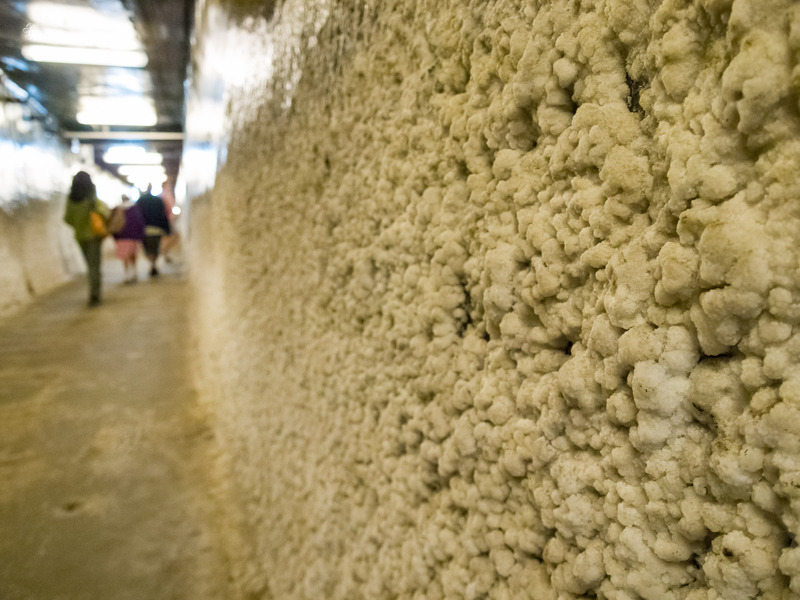 The solid crystal salt walls have an amazing texture and just imagine, those salt deposits run over 2.5 km deep in that region. The salty water shimmers under the plentiful lights. This is us, on the bridge. 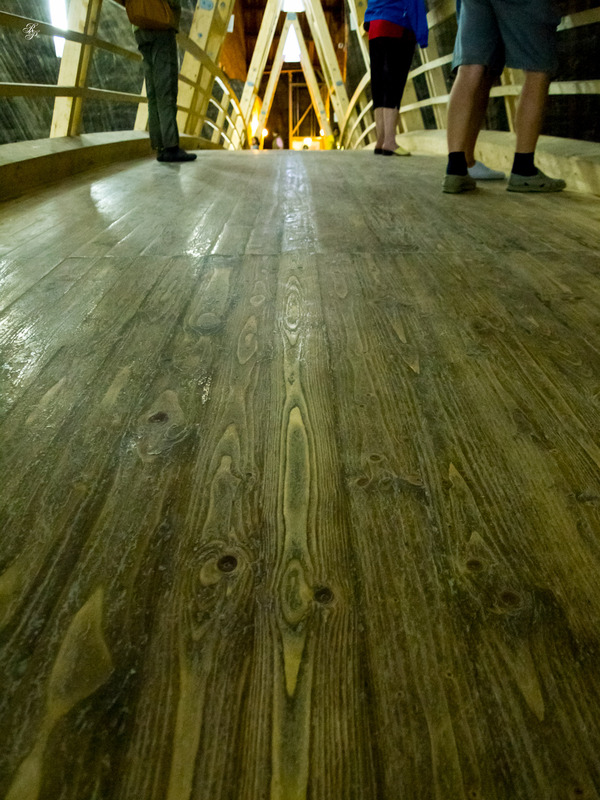 The fir planks had gained an interesting patina from the rubbing of people’s shoes and the salt deposits. 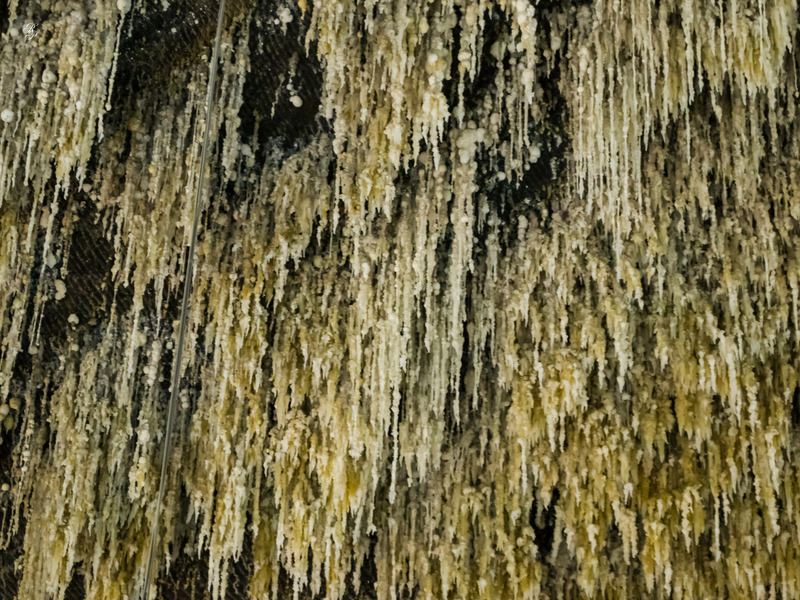 On the walls, delicate salt stalactites had begun to form, as a result of the water condensation generated by all the visiting crowds. 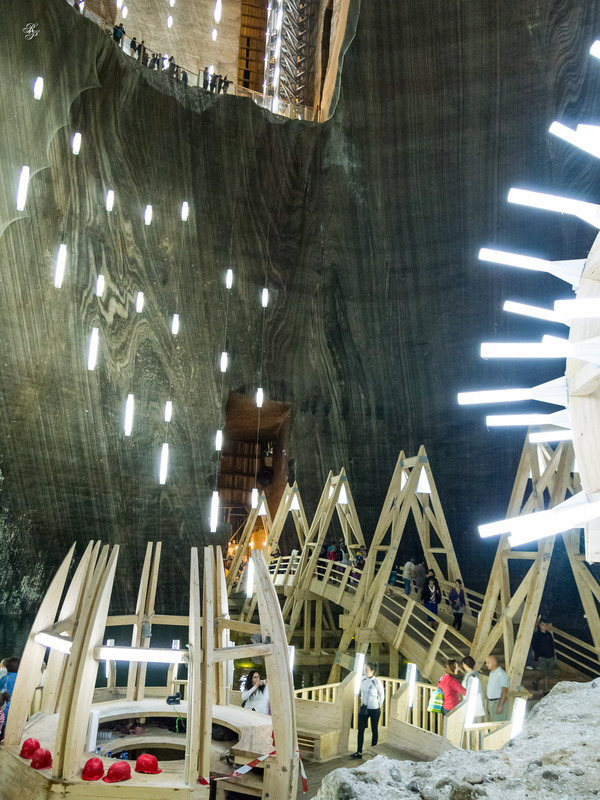 As amazing as the Turda Salt Mine looks today, with its huge vertical drops downward on solid salt walls, just imagine how it would look if they’d mine the whole 2,600 meters and you’d actually look down that entire drop. It would be deeply frightening and amazing and otherworldly and spectacular, even more so than it already is. Wow! What an amazing place. Great shots too. Nice set of photos. .